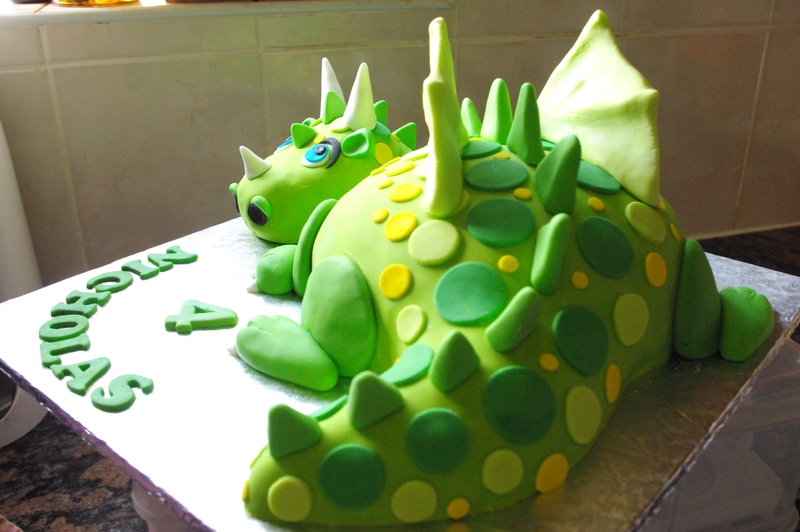 I made another dragon cake! 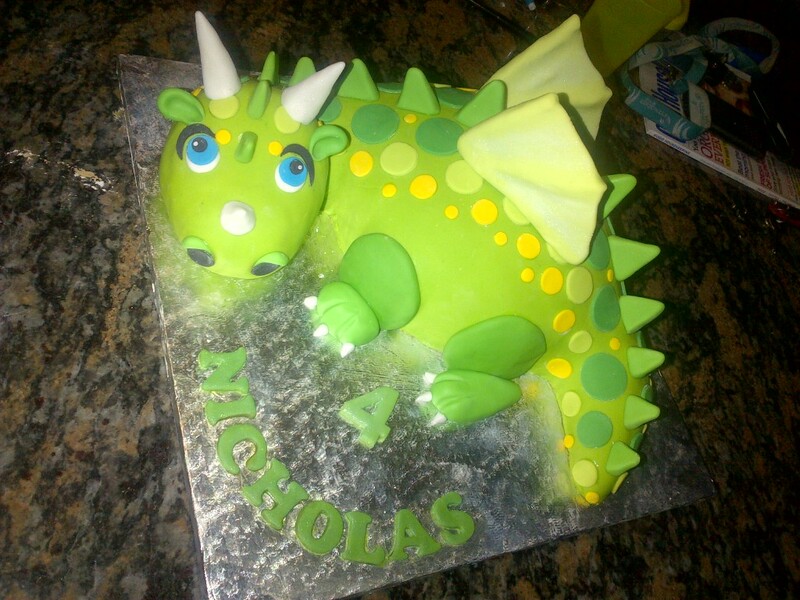 This one is green and was ordered by Collette for Nicholas’ 4th birthday! 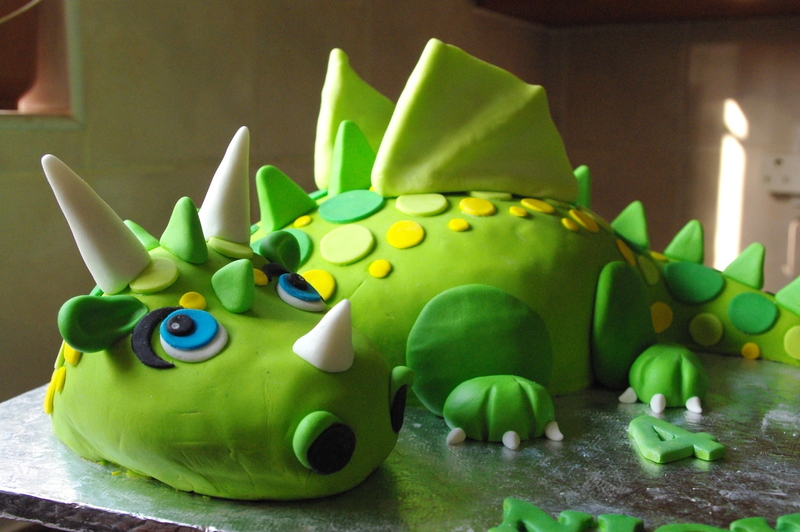 The dragon’s body is a chocolate mud cake layered with chocolate ganache, the neck and tail are a type of cake pop mixture of mud cake and ganache, and his head is made of rice krispy treats. I used some of the left over cake pop mixture to shape the body part of the cake a little rounder. Once the cake had settled, I covered it in chocolate ganache and then hot knifed it to smooth it over in preparation for the sugarpaste covering and decorating. And here he is finished (its a mobi picture, I’ll post more later). And here are some photos from my camera! I finished it! And I have had lots of positive feedback too – and that makes it SO worthwhile for me! 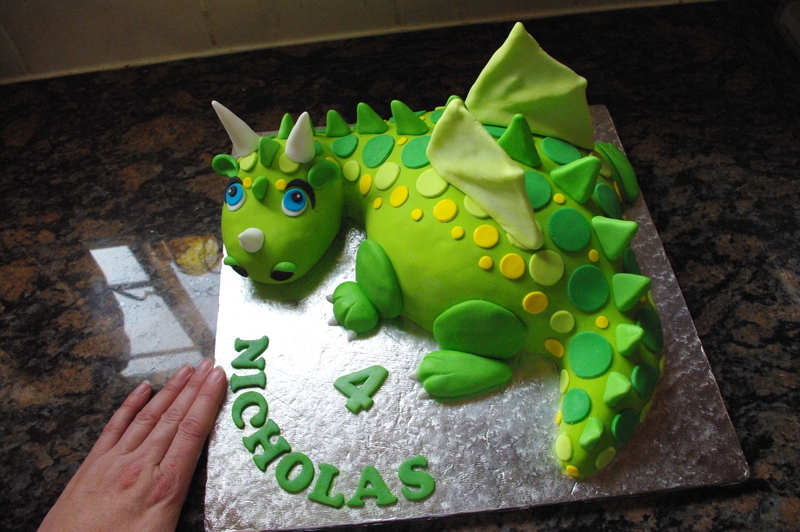 The birthday boy was so sweet – his eyes nearly popped out of his head when he saw his huge birthday cake! 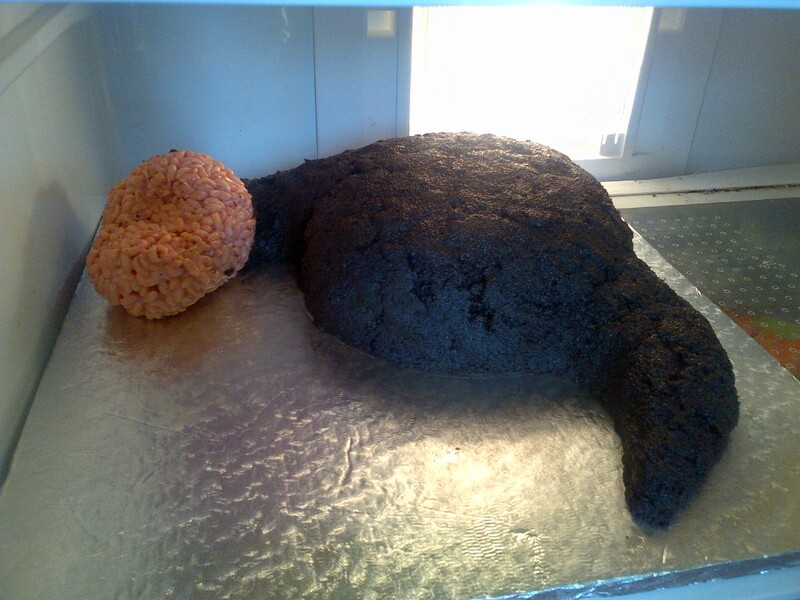 This is what the cake looked like on Friday morning! Do note that it is resting on a sixteen inch cake board – this is a big cake! The body is layers of chocolate mud cake sandwiched with dark chocolate ganache, the tail and part of the neck are sculpted from a kind of cake-pop mixture of chocolate mud cake and ganache. The head and part of the neck is made of rice krispy treats. 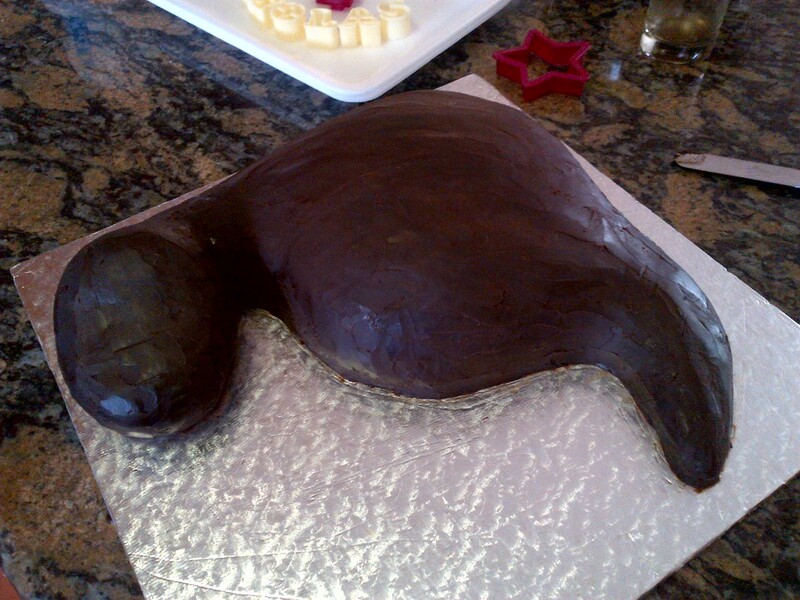 The whole thing was then covered in chocolate ganache before it was smoothed in preparation for the icing. Next time I will use more chocolate ganache, and that section between his head and his body was really tricky to do with the sugarpaste because its such a narrow space… I’ll have to rethink something like that next time. Anyhoodle. Its not perfect, but its not bad.